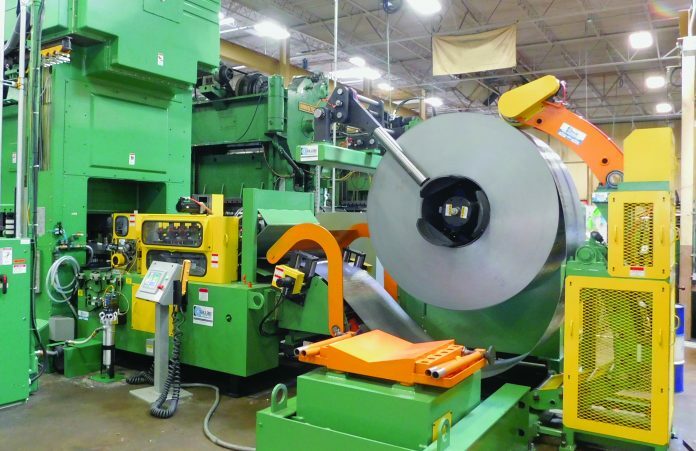 Dallas Industries™, a leading manufacturer of coil handling, press feeding equipment and controls for the stamping industry has delivered a new UnderLoop SpaceSaver™ feed line to Wico Metal Products, Warren, MI, a leader in automotive extrusions, metal stampings and assemblies. The Dallas UnderLoop SpaceSaver feed line design consists of a hands-free threading system featuring a servo-driven synthetic tension roll for maintaining proper coil tension while uncoiling. The UnderLoop system also incorporates a lower pivoting table with a feeder/straightener mounted rocker arm/de-bender for easy coil threading. The uncoiler includes powered coil guide rolls that eliminate the need for slide-on coil keepers and automatically centers the coil on the mandrel. The servo feed with pull-thru straightener combo features pilot release for both the upper feed and straightener rolls. The UnderLoop system delivered to Wico is designed to run steel up to 0.250 in. thick and up to 36 in. wide. It is rated for coils up to 30,000 lbs. The model DRFHDS-636 servo feed has 6 in. rolls and a pull-thru straightener with 4 in. dia. rolls. This SpaceSaver line only requires 20 feet of floor space. To enhance setup time, the feeder passline height, edge guides, coil guide rolls for auto coil centering the coil on the uncoiler are automatically adjusted to position. The settings for these axes stored in the job recipe—a Dallas feature termed AutoSet. Wico Metal Products was founded in 1947, and has nine manufacturing facilities located in the Metropolitan Detroit area as well as affiliated manufacturing locations in Canada, Mexico and China. The company serves numerous automotive OEM’s and major Tier I suppliers. Dallas Industries’ full line of products includes press feeding lines in both conventional and SpaceSaver configurations. Dallas also designs and builds servo feeds, heavy-duty straighteners and coil handling equipment in a wide range of sizes and capacities.